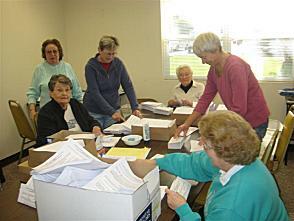 T he Secretarial Committee meets as needed to prepare mailings to Oceana homeowners and/or residents. We fold letters, stuff envelopes, affix postage, eat cookies and generally have a good time. Most mailings only take about two hours, usually from about 9:00 to 11:00 am, in the Administration office. There are three mandatory mailings each year (budget, election and insurance) and occasional others to keep us all informed about important community information and any rule changes. We average about five mailings a year. Contact: Alice Nolan at 1-760-214-0221 or click to email.